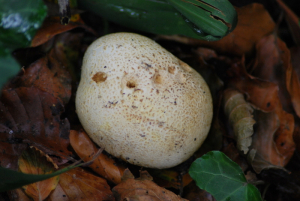 Observation - Commom earthball (Scleroderma citrinum) - UK and Ireland. Description: Light yellowy rough outer skin -inside dark gleba. Light yellowy rough outer skin -inside dark gleba.